I am happy to be able to show off something new for a change instead of just complaining about the things I am already working on. Meet the Swallowtail. This is my second try at spindling from that large bag of Merino that I've been working on since last May. 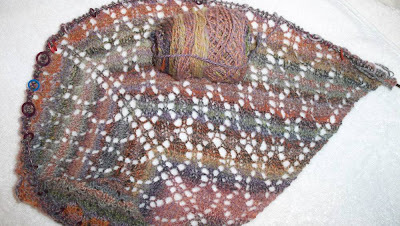 My first try, seen at the bottom of the photo, produced yarn that was too thick for a small scarf/shawl. When the temperatures are up near 80 in May, you wouldn't want the heavier one hanging around your neck in a crowded barn packed full of frenzied fiber folk. 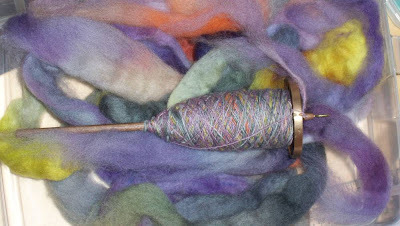 The only problem (and there is ALWAYS a problem) is that I only have about 150 yards of it spun and plyed so far and the pattern calls for almost 600 yards. 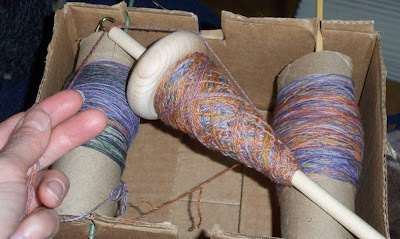 Thanks to a...um, er...grading day, I was able to spin another spindle full this week at school but at this rate it is going to take a long time to manage enough wool to do the job. 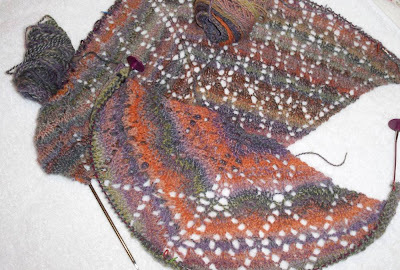 While I am on the subject of problems, I must also mention that I DO realize that Evelyn Clark's lovely Swallowtail pattern may not be the best choice for this wildly colored wool. I seem to have a distinct style collision going on with the fact that I love delicate lace patterns AND psychedelic wool. 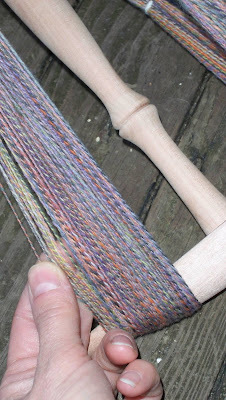 I can't even imagine spindling anything that was all one color. I would die of boredom before it was ever done. Looking on the bright side, you won't be losing me in a crowd. How much snow ARE we going to get today? This doesn't look like a "sweepable" event anymore. 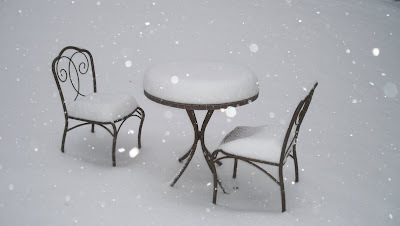 I should have bought some bread and milk. And toilet paper. When Mother Nature hands me this on a Saturday morning, there is only one thing to do. 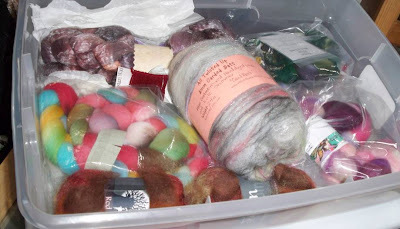 No one can ever accuse me of being a yarn snob. I love cheap acrylics as much as fine Merino but, when it comes to tea only the best will do. It must be loose leaf and prepared with all the care that would rival any formal tea ceremony. 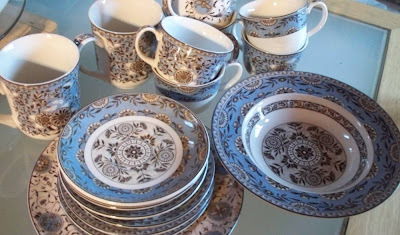 It came to my attention however, in spite of all my reverence, I did not own two matching tea cups, or saucers for that matter. Over the holidays I went on several shopping missions to solve this problem but came home each time empty handed when the price tag for tea sets sent me into near cardiac arrest. While strolling through Marshall's last weekend with Daughter to pick up some odds and ends for her move from NYC to Northern Virginia, I spied this set of reasonably priced Martha Stewart teaware in the home section. Reasonably priced being 99 cents for a saucer and $1.99 for a cup or plate. I filled up a cart and for less than $30 I now have a service for 4 and some coffee mugs and serving plates as well. If I clear out some of this monumental yarn mess from all over the house and locate my furniture I could actually invite someone over. I find myself in the middle of two projects that I am not particularly enjoying. The Thermal Socks that I began last summer are trying every bit of my patience because they seem to be getting NOWHERE. 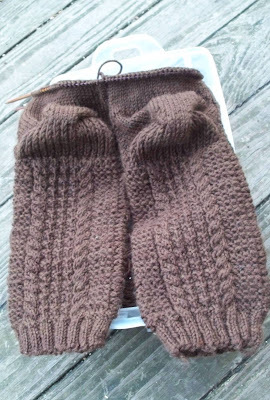 The heel has been turned so I know the end is near but those toes still seem so very far away. Then there is the Lillehammer which gone from an interesting project to a total bore. After pretty much starting over, I find myself in the limbo land of a really monotonous repeat pattern that will go on FOREVER. 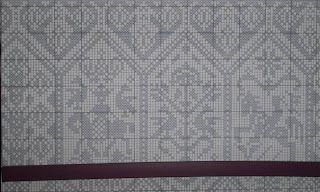 The only good news here is that the mindless repetition of the pattern turned this into a good travel and TV project. As soon as the Olympics gets started I will have LOTS of couch time to get caught up. Last May I told myself I was going to spin that Merino that I just lost and then found into something to wear to this year's Maryland Sheep and Wool Fest. In fact I began spinning it on the car ride home from last year's event and then pretty much forgot about it. In years past, the MD S &W has never been the kind of festival that brings out the wearing of handknits due to the hot weather here in May. You may see a pair of socks or two but ordinarily it is not the place to go to show off your skills. Until last year that is, when there was an EXPLOSION of lace shawls. They were everywhere and on everybody. I did wear one. One that I was not particularly proud of. I have the skills to make a show stopper and I thought I would have the time but here it is already January and all I have to show is this small bit of lace weight. 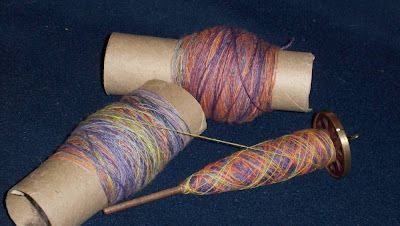 It took hours to ply the two small cones into a tiny bit of yarn that I hope will be enough to get something started. Something small. Very small. I also promised myself I would learn to Navajo ply so I could do justice to the colors but there is no time for that now. My last samples looked more like dreadlocks than yarn. Next year. Cross my heart. 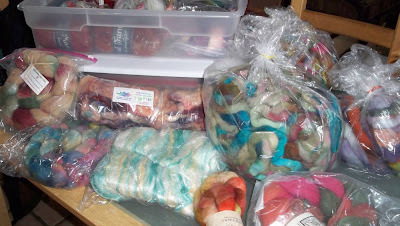 I certainly don't need to buy any more at this year's Sheep and Wool Fest in May but you can be pretty sure that I am going to. I just had to share this picture of a cake I found in a round about way over on Cake Wrecks. I have laughed myself silly on many a night reading about some of the most ghastly messes imaginable. Sunday, however is dedicated to truly glorious creations. I found this yarn basket cake on the Flickr page of someone who made the most beautiful baby shower cake I have ever seen. I have always admired people who have the patience and the will power to do this sort of thing. I tend to eat my ingredients long before I get to the point where they could be assembled into something this nice. 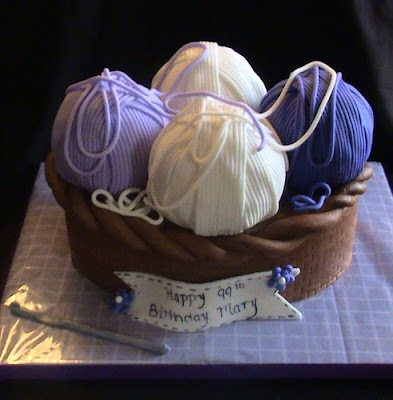 Substitute some knitting needles for the crochet hook and this is what I want on my 99th. Lucky Mary. While I am on the subject of ginormous knitting train wrecks this week, here is one that I recently had the opportunity to revisit when it showed back up at my house with an actual baby in it. 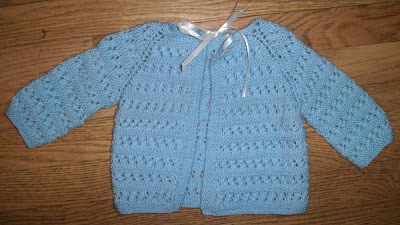 Who would make a lace sweater complete with a ribbon bow in blue for a baby BOY? His crazy old aunt, that's who, I am embarrassed to say. This was a clear case of I wanna colliding with I shoulda. I love this pattern so I thought it would work for a boy. Poor little guy. He even had the matching booties on with the big white bows. At least I didn't make the matching bonnet. When something seems to good to be true, it usually is. In addition to the Lillehammer disaster, I have been happily knitting away on a simple top down raglan using some of that pretty Bernat Jacquard that I recently bought a ton of. I thought it would be a great way to crank out some cute little sweaters in less time than the last few took to make. But just look at the front of that sweater. There is no way I could gift something with such terrible pooling. Now I have to actually use my brain to figure out how to minimize those awful color changes when I was just hoping for some mindless knit time. 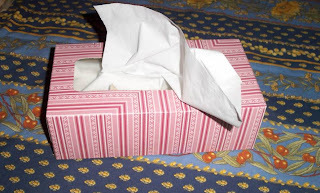 I have 6 giant balls of this stuff for crying out loud. It's got to be good for something. Insert sound of screeching brakes here followed by the sound of me smacking myself in the head. See that section that clearly states MAIN PATTERN? Hard to miss isn't it? So how did I knit merrily on for so long without realizing my sweater would end up being only about 8 inches long from ribbing to neck without repeating the frickin' main pattern for 10 and 1/2 inches AS CLEARLY STATED IN THE DIRECTIONS? 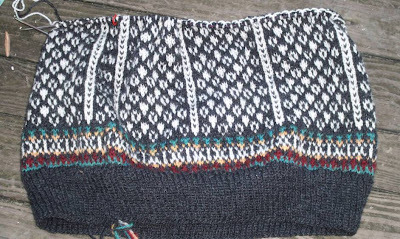 Insert the sound of me saying every bad word ever uttered as I frog back a month's worth of knitting after a visit to some Ravelry project pages that made me realize that everyone else's Lillehammer actually had the snowflake/horsey things up in the boobage area and NOT on the belly. At midnight no less. On a Tuesday. I am on this baby sweater kick and I can't seem to stop. 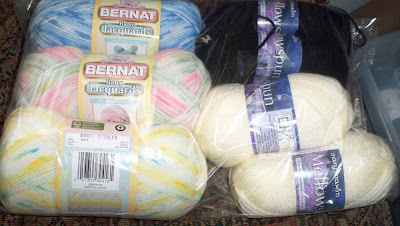 I just received another big bag of baby weight yarn from Mary Maxim. Now I need to find more babies to knit for. I need to take a minute or two away from my silly blog to remind everyone that Doctors Without Borders has been in Haiti for many, many years providing emergency medical care and at this moment they are in trouble and need our help. Their operation is in a shambles and many of their dedicated staff members have become casualties. I am a "field partner" and have made my donations to this Nobel prize winning charity for many years through their monthly direct withdrawal program which makes it easy for lazy old me to give without having to do anything special. If you have an extra dime or two laying around they could really use it right now. I am on a very STRICT budget but when I saw this kit for only $14.99 I totally caved. 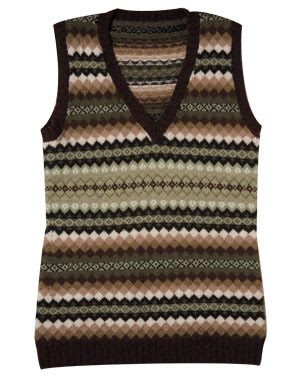 I can't even buy a vest this cute for that. Right? 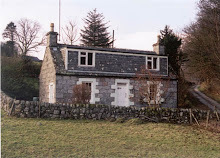 In spite of little in the way of progress with the knitting stuff this week, I have managed to come up with an idea for a post. Here are some of my previously knitted things that are helping me cope with this unusually cold winter. First, my Phentex slippers are the most amazing things EVER. I run across the snow covered icy ground all day long chasing after two very bad little dogs. 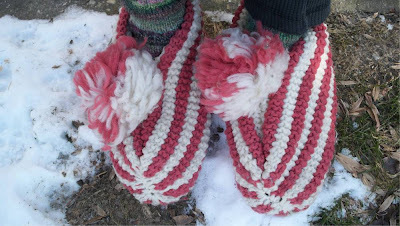 They are warm and waterproof because they are made out of a yarn that is normally used to make fishing lures. These are several years old and have no signs of wear and tear at all. I bought tons of this yarn to knit them with but have no reason to make more as I think these are pretty much indestructible. Peeking from under the slippers are a scratchy pair of handspun socks that I gave up as hopeless over the summer, only to find that Columbia fleece makes pretty darn warm socks that lose their itch as soon as the thermometer drops below freezing. 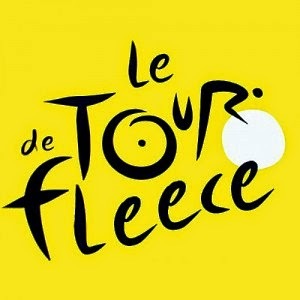 I am glad I still have a ton of that fleece in storage out in the shed. All my ugly sheep to sock experiments of the summer have been a real pleasure to slide into every ridiculously cold morning. I sing the praises of Lopi all the time here, but really, any body part covered with it is going to stay warm and dry in spite of whatever Mother Nature throws at you. My mittens are the first things I pick up before heading out. I can survive without a hat or scarf but cold hands are unbearable. If you have never knit with Lopi, trust me, it's worth the itch. 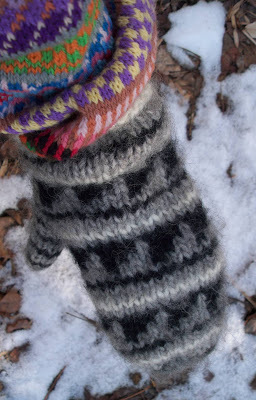 I sneeze and itch the whole time I am knitting with it but the minute snow hits the ground I am digging it out of the winter boxes as fast as I can. Yes, that is my ginormous Knit Picks Palette Cardi over the mittens and laugh you may, but it is a terrific substitute for a bathrobe when the weather is below freezing and the heat pump has no idea what to do about it. Those often criticized bright colors are the perfect antidote for cabin fever-and by the sound of this post it seems like I have a pretty bad case. 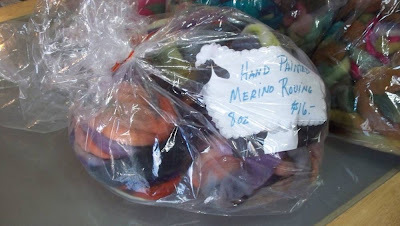 Daughter's Noro bag needed felting and this is still my favorite way. The wash machine is too risky and standing by the sink all that time is boring-so sloshing around in the tub on a cold winter night was a prefect solution. I DID give the bag a really good rinsing afterwards so there is NO danger of cooties. 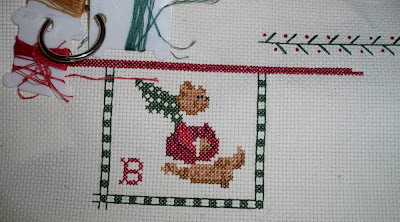 Besides the holiday quilt that I had intended to work on over the winter break, I also had planned on putting a few stitches into the Christmas sampler I started last year. I am sorry to say that not a stitch went into anything this year. 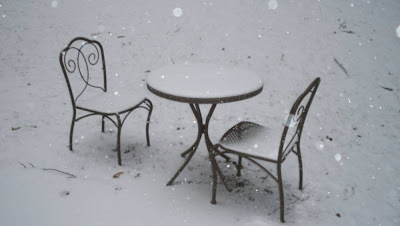 I need another blizzard, one that snows me in ALL BY MYSELF. The little coffee drenched top down raglan is coming along nicely. I suspect it is going to be too big but I can't be sure until I get my hands on the little wild thing to try it on. 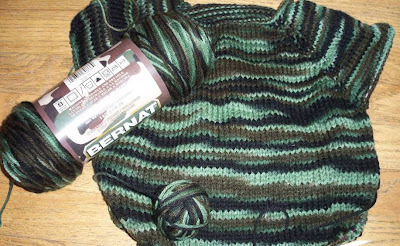 I am knitting a size 4 for my 3 year old nephew but a gauge check is telling me that it is going to be on the large side while he is on the small side. He is currently squeezing himself into the same sweater I made for him in the 6 months size. Really. This is what is left of our New Year's dessert. 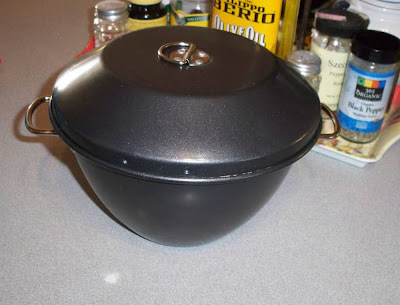 During one of my holiday shopping sprees I spotted something I have coveted for a long, long time, a steamed pudding mold. At only $9.99 it was a real bargain. 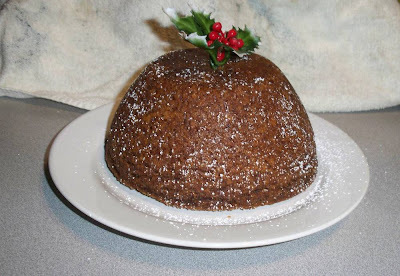 So far I have steamed up two puddings and then set them on fire using The Mister's precious rum. It was spectacular fun. 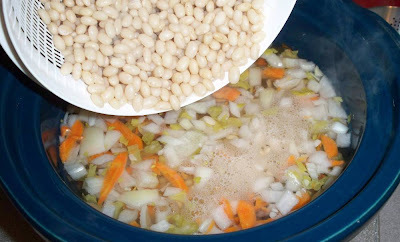 And the best part is that listening to the pot hissing away on the stove for several hours during these bitter cold days has been oddly comforting. 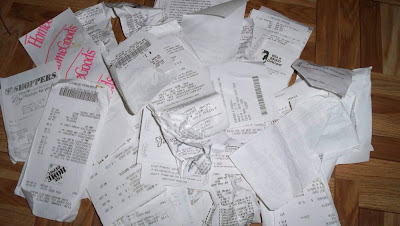 I sat down to tackle the giant pile of receipts piled on my desk and to my horror discovered I went through $1500 between Thanksgiving and Christmas. All in the interest of jump starting the economy, of course. Good thing I have that nasty old job to go to. I always have a good cry on my way back to work after the holidays. I boo hoo my way through my hour commute overwhelmed by homesickness and regrets. There are so many things I planned to do with my precious days off and now it is too late. This was a year of notable omissions to our family traditions. 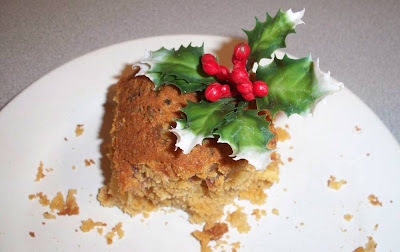 No yule log cake. No Santa Claus jigsaw puzzle. No cans of carefully crafted spritz cookies. No real presents under the tree to speak of. It was a very grownup holiday, streamlined so I could manage more important things like regrouting an ugly pink bathroom, or so I thought. I want to do it all again. Right now. 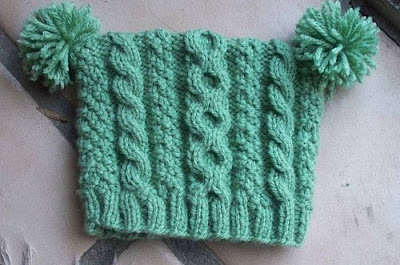 The hat for the Little Leprechaun sweater is the cutest thing that almost never was. I frogged the little thing 4 times before I finally decided to actually follow the directions. For some reason I thought that just improvising the design would suffice but apparently the designer knows what they are doing and I don't when it comes to fitting hats on baby's heads. I did forgo the doubled over rib for a simpler version and the tassels were exchanged for pom poms. I also knit it in the round using the Magic Loop method and then used a 3 needle bind off instead of knitting it in pieces and sewing it up. 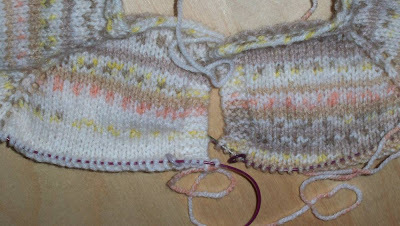 Having said all that it seems I did make a lot of changes to the original pattern after all. We didn't have much of a Christmas around here but the holiday stash is over flowing. 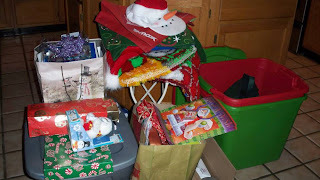 Where am I going to put all this junk until next year? 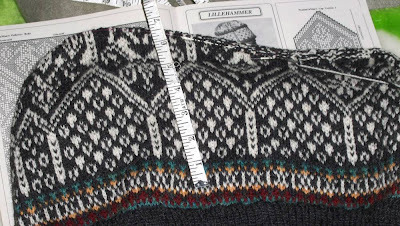 Now that all the holiday gift knitting is over I am resolved to stay focused on finishing the Lillehammer, especially after I saw that gorgeous one walking around at Rhinebeck this year. More easily said than done because now I am heading into this part of the pattern. Those large sections of color are scaring the bejeebies out of me as I am prone to puckering. 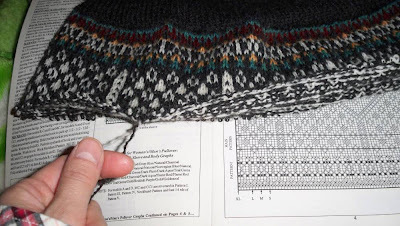 I intended this as my "sit on my backside for two weeks while watching the Winter Olympics" project so managing this pattern AND serious TV watching is probably going to be interesting. I probably should have stuck with the simpler and much criticized Vancouver sweater but I have had my heart set on this one since well, Lillehammer. 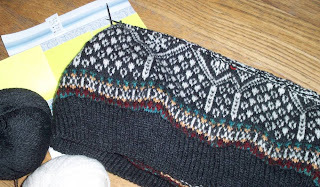 My last Olympic sweater actually took me 2 Winter Olympics to finish and it was just a simple Lopi. This is going to be a challenge.